A RESCUE operation has been launched today to save almost 500 people onboard a ferry that caught on fire midway through its journey. 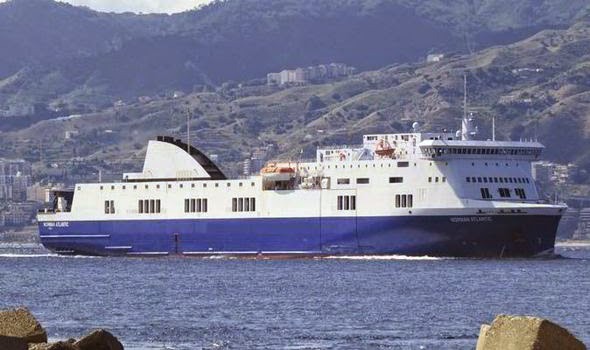 The blaze broke out this morning onboard the Italian-flagged Norman Atlantic which was travelling from Greece's Patras port to Ancona in Italy. Some 478 passengers along with crew members are onboard the ferry which caught fire in gale-force winds near the Greek island of Corfu. An evacuation of the boat is currently underway and as many as 130 people had reportedly been rescued but that was no confirmed by Greek officials. Authorities added that no passengers were reported injured and the ship is not in immediate danger of sinking. The fire began in the lower deck of the ferry and passengers who waiting on the upper level to be rescued told Greek media they were "trapped" on the ship. Speaking to The Daily, one person onboard the ferry said: "We urgently need help. We cannot leave the ship. There are boats but we are trapped." Another told Greek TV: "They tried to lower some boats, but not all of us could get in. "There is no coordination. It's dark, the bottom of the vessel is on fire." While one passenger told the MEGA TV channel: "We could see fire everywhere. The flames were coming from the garage, cabins..."
A life boat carrying around 150 passengers was lowered into the waters but authorities said only 35 were moved to a nearby ferry. Shipping Minister Miltiadis Varvitsiotisonly said high winds of up to 55mph and the fire has made the rescue operation extremely complex. Mr Varvitsiotisonly added: "This is a very difficult, a very complex rescue operation. "The visibility is poor and the weather conditions are difficult." "We are in constant contact with Italian authorities and the Greek armed forces. "We are committed to rescuing everyone on the ship, and are trying to ensure that nobody will be left unaided." Five helicopters and a military transport plane were sent by Greek authorities to help with the rescue operation. Their Italian counterparts are also involved. The ship is believed to be 42 nautical miles away from Corfu and at least seven merchant ships are being used to form a barrier against high winds in the area.